← Y: Choose Comic Books? V (for Vendetta), W(atchmen), X(-Men), Y(: the Last Man)… Z? Much in the same way that my childhood guy friends introduced me to Star Wars and video gaming, they also introduced me indirectly to the world of comic books. Growing up, I was no stranger to the X-Men franchise, or the usual pantheon of superheroes: Superman, Batman, Spiderman, etc. We are definitely in a superhero/comic book genre cycle, so it was inevitable that I would be touched by it in some way. I’ve actually read a comic book before Y: the Last Man. When Watchmen came out a few years ago, a couple of my guy friends said to me, “Dude, Shirley, you totally have to read this. It’s going to change your life!” Did it actually change my life after I read it? No. But did I enjoy it? Absolutely! And having already read Watchmen made reading Y: the Last Man much easier. It was enjoyable experience, because I found the plot to be quick-paced but never lacking in substance. I like that the characters, for the most part, are multi-dimensional. A sense of realism prevailed, despite the deus ex machina in the beginning. Like other people, I was frustrated by the unsatisfactory ending which didn’t explain the original Y-chromosome extinction. Though of course I should have seen it coming; the cliffhanger is the most effective way to ensure future sales. I find that both Watchmen and Y: the Last Man are unafraid to explore pressing social and political issues, and that the comic book genre is particularly well suited for doing so. In marrying images and words, the genre is able to effectively both show and tell its message. I think it’s definitely an underrated medium, but that seems to be changing. After doing a quick search around Google, it certainly seems as though comics are enjoying a renaissance. I hope that in the future, it overcomes its undeserved “nerdy” reputation and makes a comeback, because in the right hands, it can be a powerful tool of communication. 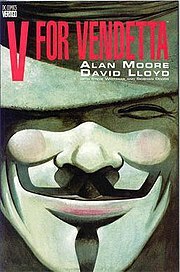 One graphic novel that I’ve always wanted to read but have never gotten around to doing so is V for Vendetta. I am a fan of the movie, though I’ve heard from many sources that it doesn’t hold a candle to the comic, even as good as the film version is. The movie appealed to me because of its sophisticated message and its enigmatic characters. V is both hero and anti-hero; shaped and made powerful by the very people he wishes to destroy. I think one of the things I liked best about him (besides the fact that he can make devastating homemade bombs as well as he can quote Shakespeare, or make French toast) was that he didn’t look like a “normal” superhero. Unlike Marvel of DC Comic heroes, V fashioned himself after a historical figure, and though he protects his identity as fiercely as any self respecting superhero should, he does it for different reasons. Here Alan Moore and David Lloyd have created a character who is as flawed as he is perfectly suited to his task, as vulnerable as he is powerful. A potent leader, full to the brim with political, historical, social, cultural, and literary allegory. So considering it’s such a classic, and how much I already love the film, I really should get on to reading V for Vendetta. I’ll ask a friend to let me borrow his copy tomorrow. This entry was posted in Uncategorized and tagged Blog #5: Comics, Y: The Last Man. Bookmark the permalink.